We’re not going to lose the run of ourselves. 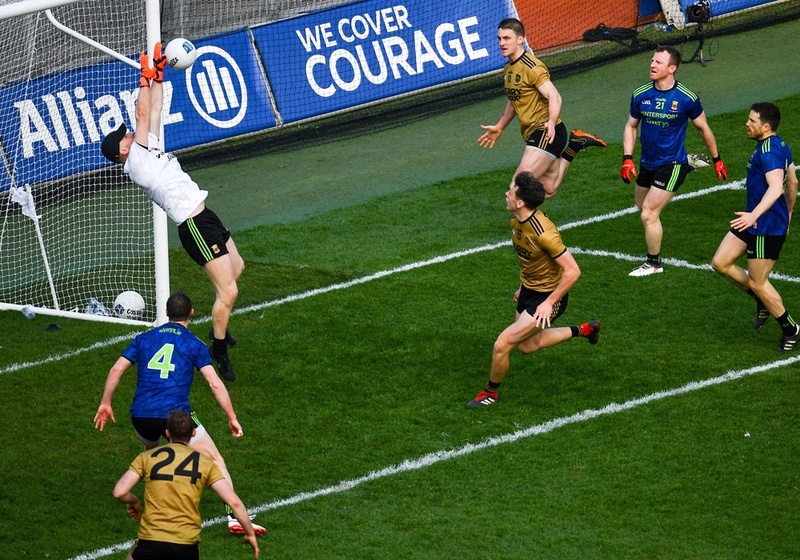 Too many Mayo supporters have been scorched too often in the past to let their imaginations run wild now that we’ve finally tasted a bit of success on the national stage. We’re all way too battle-hardened for that. But what we can do – and what we should do – is to savour the moment and enjoy Sunday’s win for what it was. A thrilling comeback, a second half display that showed what a Mayo team playing at its best is capable of doing, a tidal wave – a blue one! – that swept Kerry’s challenge away and carried us onwards to a twelfth National League title. We’ll all harbour deep in our own minds a few memories from Sunday at Croke Park. Two in particular stand out for me. The first is an obvious one, about the connection that exists between this Mayo team and its supporters. We’ve gone into battle so often together at this stage that we do so in unison. The team feeds off the support, the fans up their game in response to what the players are doing out on the pitch. On Sunday, for the first time in a national final at Croke Park, we carried this all the way to the finish, to the steps in the Lower Hogan where Diarmuid O’Connor accepted the silverware on behalf of his team, the county and Mayo people everywhere. That unique bond has been there for years and we knew of its existence well before Sunday’s emotion-laden finale. But what we saw this time was different – as we came down the closing stretch both players and supporters alike glimpsed the glory that awaited and together moved in to claim it. The second observation from Sunday relates to how sport can often mirror life, at times – as we know so well – in its cruelties but sometimes in more uplifting ways. On Sunday we were given a vision of sport as redemption and it was presented to us in the form of Robbie Hennelly’s beaming face. Robbie should never, of course, have been scapegoated in the way that he was after what happened in the 2016 All-Ireland final. That match was lost – by the narrowest of margins – for a variety of reasons, yet most of the blame for the one-point defeat was unfairly heaped on the Breaffy player’s shoulders. It’s been a long road back for Robbie. This year, however, you could sense his confidence returning and when it became clear in the days leading up to the final that David Clarke might not be fit to play, the notion that Robbie would be between the sticks for us once again in a national final wasn’t one that gave any cause for concern. But that alone wouldn’t have been a compelling enough storyline to make it really noteworthy. What did so was Robbie’s truly outstanding performance in the final, where he repeatedly rose from his line to fetch incoming high balls that could have crept over the bar, where his restarts were flawless throughout and where, in the dying moments, he pulled off a miracle point-blank save from Kerry’s David Clifford. Had that effort hit the net, the result – and all the headlines – would have been very different. But it didn’t and, on a day when we had many outstanding performers, Robbie’s heroics between the posts is a special memory to treasure. His display provided vivid confirmation that nice guys don’t always lose and that sport – like life in general – can sometimes demonstrate in the most uplifting way the power of redemption. This article first appeared in the Mayo News, 2nd April 2019. For me, the moment was Tracey’s goal. All day. It’s so crucial in a Mayo context because failing to finish off very scoreable goal chances in finals has always and forever been our achilles heel. So many good players have been guilty of this. It has held us back and it has been a right sickener up until Sunday. Tracey made it look easy which is the most pleasing aspect of it. Fair play to Andy in the newstalk podcast there – noting the importance of this very thing – “youth” having the courage to take the 3 points where he and more of the older players would have likely popped it over the bar. This is the kind of ruthlessness we need, this and more, to continue winning finals. We’re well able and always have been. Crucially, credit must be given to Horan for instilling a belief. It’s pretty clear he’s in their heads. Sport is all about creating the unity, the shared goals, the drive, the absolute essential conditions to be winners. I was right but a little off when I wrote before the game => prediction time, Robbie for the win. BOOM. Was thrilled for him to come thru the way he did. Congrats RH! It was a pleasure to watch the post game as well. Seeing the team and fans celebrating and getting the monkey off their backs. Diarmuid is a great ambassador for Mayo. He was very humble and gracious to the opposing team, refs, squad, and most importantly to the fans. I can’t wait for the next fixture!! Was there with my 8 year old who has green & red coursing through his veins. Whats so different u might think, born & bred in Tribesland but already devoted to OUR cause. Only 8 but had to endure 7 losses to Galway on the bounce & 2 heartbreaking finals, but spirit never once wavered, “we go again” & “it’s a journey” are phrases we throw out regularly at Caltra U9 football training. This team have been heros to us all but from one 8 year old in Galway & his ole man, we have to say, THANK YOU SO MUCH. Training was far more enjoyable for him Monday night. The bounce that win will give the lads going into the summer is unreal. The likes of Cillian, Hanley, Seamie, Clarke and young O’Donoghue will all return from injury shortly. Reape will be very disappointed not to be involved. The competition to make the squad is unbelievable at the minute. This is not something we’ve had before. Oops… meant sarahmac…but annmarie yours was lovely too:!! same for me Liberal Role in the tie – I’ve said it to anyone who’d listen, it was very brave of Tracey to go for the goal when he did, he backed himself, he beat the keeper and he put the result beyond doubt. He killed off the game and while it was already in additional time, its something we haven’t managed to do in a game since 2012 against Down and 2013 against Donegal. We’ve made habits of letting teams back in, think Cork and Kerry (twice) in 2014, and god knows how many times since. We were the better team on Sunday but we squandered so many chances we should have been out of sight long before that. Whether that was nerves or just poor finishing, hopefully this result can do away with the former, and give us the focus us to work on the latter. Should this have been our 13th title? We won 6 in a row up to 1938-39 then this happened! As a protest we pulled out of the League in 1939-40 (that and petrol rationing due to the war) then came back in 1940-41 and won that league too, then the league was suspended till 1945-46. Anyway Kerry people always say we are bitter in particular when we are playing them, I don’t think that is the case but there is a history of them winning and us losing (for a multitude of reasons) and I don’t think they like this current hegemony we exert over them. Truth is they still don’t fear/respect us and I guess over 100 years of dominance gives them that entitlement but it is good that things are changing. Anytime I speak to my Kerry Friends they say “Yerra sure we’d love Mayo to win an all Ireland , …. but not this year” and that just shows that they believe wholeheartedly that they should be winning Sam every year and when they ever go 10 years or so without winning its a Famine. Really lovely piece WJ, especially the piece about Robbie. Delighted for him on a personal level and for us on a playing level! The single best thing about this league has been the way the young lads have taken on such a leadership role. From the outside, it’s almost like they feel a greater sense of entitlement to be winning big games, because they don’t see why they shouldn’t? There is a real killer instinct there combined with what seems to be a lack of fear of losing … epitomised by the way Ciaran Treacy was never going to go for a point. Diarmuid O’Connor too epitomises this confidence; this way of thinking could really be the difference in the long run. Of course this is just pure amateur psychology and could be a load of shite, but Andy Moran’s interview was really telling in that he said he probably would have gone for the point. So it’s good to see that impetuousness and audacity creeping in via our younger players, some of whom looked like they had been playing in Croke Park all their lives. Obviously, it’s early days too. Tommy Conlon’s piece in the Times is well worth a read for the sense of balance he brought – he referenced the lunacy (I’m paraphrasing) of some of our shot selection when we really needed to be making better decisions, and he is spot on – we really left ourselves so vulnerable to an ambush at the end by not retaining our composure and taking our scores despite all our hard work, and that just won’t wash later in the season. Citywest … I think there is a certain element of the Kerry support for whom bitterness is now creeping in. Epitomised by a middle aged man in a blue jumper (no colours there) tapping me on the shoulder, unprompted … “Ye’d want to catch yerselves on… ye only won a leeeeeegue” … like we didn’t know that – talk about raining on the parade! I told him they had been such good winners down the years that it would do them no harm to learn how to be gracious losers too. Then his wife told him to cop on to himself 😀 It might have only been a leeeeegue but they weren’t one bit impressed to lose it. Their day will come again too though. Jesus though it was a great day and I’m still on a high from it. Then I flash back to Newbridge and see Diarmuid trying to save a ball on his last legs, and then that speech sun evening from that very same lad. How could you not have tears!!! Hope those those 2 lovely Mayo Mulligan lads releasing their 1st movie Friday night ‘the limit of’ will make the movie on the MAYO football journey some day. A lovely piece. A great day for Robbie Hennelly. I think you can see how much he has been working on his game, especially under the high ball. It takes serious guts to get back up and decide that you are not going to be defined by one poor performance. To graft and work your way back into the team after that kind of setback takes a certain kind of person. Not everyone would be able to go back out and face another training session after such a day. A man of real character who was subject to frankly scurrilous abuse in the aftermath of that final, even from some prominent media figures who really should have known better. I’m absolutely delighted for him and I hope this taste of national success drives him and the rest of the team on to better things come summer. Great writing Willie Joe. Sums up a fantastic day for Mayo people here and around the world. What’s rare is wonderful. Only the eighth win in a National final for a Mayo county or club team in 48 finals since 1989. Reducing that 1 in 6 strike rate in finals hopefully will happen in the near future. Still when all is said and done it will most likely still be a Dublin v Kerry all Ireland final and the league will be far from everyone’s mind . Great piece Willie Joe and referencing Rob H. is quite right – I mentioned his commitment to the cause after the Dublin game, and he delivered two in a row on Sunday. “From Mayo’s perspective they have to be ravenous for some appreciable success at this stage, and Sunday presents the chance for the county to win its first League title since 2001. It’s easy to say in February and March that the League is only the League, but every county – with the exception of Derry – that has won a Division One title since 2001 has won the Sam Maguire Cup in that time also. And nine times since 2001 the NFL champions have gone on to win the All-Ireland title later that same year”. Those stats are important and should give us some comfort. We know well, that the Rossies (and don’t rule out Leitrim), could turn us next month, but the stats suggest that if you are good enough, the league and All Ireland are complementary. Remember Cork won 3 leagues in a row, and their All Ireland of 2010 was sandwiched in between those wins. Hands up, I had abandoned my feeling that the league was worth winning – our recent final appearances seemed to leave us late getting to the pace of it. However, I remember arguing strongly around ’13, or ’14, that we should make winning it a priority. Now, we have won it, discovered some exciting talent, have played nowhere near our best, and had free-taking problems in virtually every game. Lots to work on, and that’s the way it should be in early April. Great writing there, Willie Joe and Sarah Mac. In all the excitement of last Sunday and well over a hundred post’s on this Blog, many may have missed it l… One contribution really stood out for it’s wonderful writing, a marvelous piece of prose written especially for the occasion and capturing the mood of the county wonderfully. It’s worth having another look at a piece by Revellino last Sunday! Sean Burke, I agree with ya to an extent. Dublin will be AI champions 2019. Who plays them in the final is the question. I think it’ll be either us, Tyrone or Galway. Think Kerry wont solve there problems in time and will get caught in a semi. Sundays win is a big stepping stone towards a serious tilt at sam 2020. Dublin will do the 5 in a row, and Gavin plus a few others will be gone. That’ll leave it wide open next year, where our young lads will be well bedded in and will be physically even stronger. Our main goal for this year is to reach the super 8’s, and see where it takes us. Winning Connacht would top a brilliant year no matter what happens after. But if we lose yet still make quarters ill be happy. I read the Mayo News cover to cover and laughted out loud several times and nearly cried a few times too. Some very witty and some very heartpulling articles. Let’s keep our feet on the floor……Sean Rice? “A win for all of us”, how appropriate a heading Willie Joe, must have lifted the spirits of every GAA loving Mayo person all over the world. It might only be the League, or so say the hob-nobs of the game would say but for Mayo, it was much much more. Seeing our lade climb those famous steps and watch each in his turn hoisting the cup to the sounds of, The Green and RED of Mayo echoing around the ground, was truly hair raising stuff. We have walked the walk on so many occasions only for us to fall at the final hurdle, makes winning any national title all the more rewarding. We as supporters, can all allow ourselves to glow in the aftermath of this win for a week or two, as I’m sure the players will too. But James and the players are grounded enough to know that as Spring gives way to Summer, the journey is only beginning. I’m really surprised at how seamlessly the newbies have slotted into the team..They were really fearless on Sunday..More of the same for the Summer please. Your finest piece of writing Willie Joe! That sums it up for us all. And now it’s next stop New York City…who said being a Mayo fan was misery? Thanks very much Leantimes. You have me blushing. A win for all of us. Says it all really. No more to be said. I have been walking on air since Sunday. I know many many more Mayo people have too. Its a fantastic feeling. Backdoorsam – It’s one of the best decisions I’ve ever made. Surprised the oul lad as he walked into the Hogan and the day unfolded from there. I’m one of the guys who pondered if we should care about the league final but I’m happy to admit I was very wrong. Watching the young lads grow into that final, and the older lads rekindle their flame was just superb. I walked (glided) up the road afterwards and met my Dad in Gills for a few pints. The north Mayo crowd always gathers there and I’ll always remember the quiet satisfaction of the evening. Absolutely worth every shilling. Anne-Marie – We experienced a similar (to be honest out of character) remark from a few Kerry fans as they left Gills. They were three middle-aged gentlemen (again no colours) and as they jumped into a taxi outside the pub, they shouted back “it’s all ye’ll win this year” and then dived into the car. This little outburst was greeted with general bemusement, and to be fair two young Kerry fans beside us simply apologised. Yep that’s about sums it up dunphy , dubs have Sam in the bag , bar a complete meltdown which isn’t going to happen .They have so much quality and athleticism all over the pitch and indeed on the bench also . Id snap your hand off for a Connacht title but again I just see it as a bit early for our new additions , Galway have our number last three years now , corofin lads should be more involved this year you’d imagine plus comer should be back for June 16th if we did happen to manage the Ros . Brilliant day on Sunday , Trojan effort in the second half , they really were excellent to a man . I only caught the second half on TV , was watching the soccer ,but at least one got the good bit. Well done Mayo . To be fair Rock it is totally out of character for sure – down the years I’ve generally found the Kerry fans to be thoroughly decent both in victory and defeat. Lovely tale of your return from exile – a pretty perfect day all round. I think what has made Sunday so very special is the element of surprise that surrounded all of it – the getting to the final, the winning it and the unanticipated outburst of emotion. Although once we got there, I genuinely felt all along (even in those torturous last ten minutes) that we would win it, but at the start of the day I wasn’t too upset at the prospect of losing it either. Then when we won to my surprise I though my heart would burst out of my chest with joy. Totally unexpected and absolutely wonderful. Feck the begrudgers, we’ll knock a few more days out of this yet. – “Business as usual” was a comment uttered by a elderly Kilkenny supporter sitting behind me at an All Ireland final a few years ago. The fact that it was only half time did not make any difference, he truly believed they had the match won and as it turned out they did. – Mind you when they did win he and a number of other Kilkenny supporters left at the final whistle, no waiting to see the Liam Mc Carthy cup presented. – Until Mayo start winning the big matches on a regular basis we will continue to be dis-respected by the bookies, the media and other counties. – Here is hoping the day will come when we can be as confident as the typical Kerry or Kilkenny supporter because we truly believe. Well Beaten by dubs in under 17 game tonight . Four points actually , so not that well beaten. Updates early on indicated a thrashing must of finished well. Met a few Kerry men who reckoned that we are pretty rough and bullied Kerry off the pitch but that we were the best team on the day. I always pride myself on the fact that we have always played the ball and did so again on Sunday. We had serious problems with Stephen O Brien on the day. He induced several frees and 2 yellow cards in our attempts to tackle him. He wasn’t slow himself as he pushed Diarmuid out over the sideline, no yellow though like AOS got and moments later took out a Mayo player in a third man tackle in the middle of the field. I thought they did a lot of pushing in the back stuff, James Carr, and got away with a fair bit of it. It’s sneaky and it’s Kerry and disgusts me. Delighted that we came out the right side at the end. The shemozzle at the final whistle suggests to me that Kerry don’t like losing and decided they would show it. After all that they have won down the years, now that disgusts me too. We had problems with Stephen O’Brien partly because he is a good player but also mainly because he is allowed to take fantastical amounts of steps. Before he set up Clifford for THAT goal chance, from the time O’Brien received the ball to when he bounced it, he took 13 steps. 6 or 7, fair enough, but 13 is just ridiculous. I counted them using Mayo Mick’s footage on Youtube and slowing the speed down to slow motion, which is a handy feature on Youtube I didn’t know about 🙂 Can’t wait to break it out on Ciaran Kilkenny later in the year! @Olive Kerrigan, Bookie’s don’t ‘disrespect’ or ‘respect’ Anyone, Anything or any Team,! They respect money placed on any particular outcome of any unknown future result. They also make a profit on every possible outcome, regardless of what it is, if they manage their book’s correctly .. I never particularly mind Mayo bring at longer odds than our opponents any day, nor am I particularly enthusiastic when we are strong odds favorite’s. The Bookie’s Job is to take money out of your pocket! Yes bookie always wins but it is misguided to think the favourite always wins . About 35% of horse racing favourites win. I’m not sure what GAA percentages are but to follow the favourite route , Mayo will lose to Galway in the Connacht final, win their qualifier and find themselves in the super 8 group with Kerry and Tyrone , finishing third in said group. Dublin will play Tyrone in one semi , Galway v Kerry in the other , Dublin will play Kerry then in the final with Dublin winning. All that accumulated would be big enough odds but very slim chance of all working out that way but the Dubs winning it is highly likely . I’d hazzard a guess a team like Dublin at odds on before a competition starts would be a 75/80% success rate. Everhopeful, I have a feeling we might have been the instigators of that schmozzle at the end, though I’m open to correction on that. If we weren’t, it was an incredibly foolish move on Kerry’s part.If we were, I’m not even slightly apologetic because a la Dublin in the 2017 final, it killed a minute and a half in added time. Delighted you went to that Rock!! Great story on your Dad!. That schamozzle was fully instigated by us, and rightly so. We learned our lesson the hard way. Loved the way Ruane dragged young O’Connor like a doll of Durcan. When Aido was been dragged again Galway last year, no one went into help. Signs are Horan is bringing a harder edge to our game, and its great to see. Anne Marie I have a feeling there may have literally been the traditional Referees yellow card cop out – as in “both of them were at it” as regards the cause of the Shemozzle. I beleive the Kerry lad was pulling and dragging out of Durcan when Robbie was taking the kickout, preventing Paddy from making his run. All the while, Matty, Andy and Ciaran Treacy were putting together the move to seal the deal. I think Paddy was just returning the favour. Even if thats not the case, I was still delighted to see it. I can guarantee you that Kerry would be doing exactly the same if the roles were reversed. They did exactly that down in Limerick at the end of that game too, so they can have absolutely no complaints when the favour is returned. Jesus TH, you’re not taking many chances with that selection. Cillian must get game time, ditto Schlingerman and Seamie. Ryan O’Donoghue – ideal for him if fit. Fionn Mac needs game time now. I liked the look of McCormack against Monaghan. Diskin? he needs more exposure too. I find it strange that nobody on here or in national papers mentions Boland when discussing players that have added to the forward options. Player form can change over the next month but right now he’s a championship starter. He has taken his chance when he got it. I must confess i have done a complete u-turn on Bolands chances following the last few games. Yes, i have noticed Boland and all the others and can but marvel. When i think of all the 35 players reviewing the 8 matces in League, they surely are going to learn so much. I noted that someone in Kerry sends out Snippets? to individual players of what they did right and wrong or could have done. I can well imagine James Horan giving a Masters class on each game. They will have a Summer Camp and Challenge matches and be the most formidable team in the 2019 Championship. This is the year. Supermac – That’s the team I would go with for championship as well but I’d start James Carr ahead of Coen. I know we don’t have much to go on but he’d a very promising debut on Sunday. I can also vividly recall Aidan on the receiving end of some treatment from Galway last year while he was on the ground and no one came in to assist from our side. It was the same the previous year when Comer rattled Diarmuid and then leered over him. I’m not advocating we empty the benches (yet) but that should never go unanswered. That leaves out loftus, regan, Diskin, drake, 2 O’Donoghues, gibbons, c o’shea, Reape, j Durcan, Hanley, Crowe! That’s cleared the ticket situation up for New York then……. Rock – fair play to you lad, jumping on a flight from outside of the country to make a league final is belief, real belief in a cause and in a team. Kerry are a mighty footballing county and decent folk too but those few surly men (not wearing any colours – jez love that phrase!!) simply don’t appreciate what it takes to give your all in support when the prize eludes you for so long. Enjoy your travels this year. Had a listen to Terrace Talk on Radio Kerry on the auld interweb last night, they really aren’t happy about losing to us again. Lots of talk about off-the-ball grappling by our lads, starting schemozzles at the end of the game and whatnot. I recall that when similar stuff happened at the Gaelic Grounds in 2014, perpetrated by Kerry, we were more or less told to shut up and stop whingeing. Well, what goes around, comes around.